So this week felt like a bit of a week of two halves. Last weekend was fairly leisurely and the start of the week was too really. Over the weekend I did a few jobs around the house and garden, saw family and friends, but nothing really stand out. Then this week I was in my normal routine. My walk along the canal on my way to my class turned up this strange sight of a large Lego giraffe. I don’t even know why it was there. I went for my weekly swim. I have been swimming regularly now for about 6 weeks. I started by gradually trying to build up the number of lengths I was doing. I’ve now started trying to swim more without taking a break to get my puff back. I did stop this time to talk to my neighbour who happened to be swimming too, but I only too that one break and kept continuously swimming the rest of the time. Once I can do the lengths a bit quicker without a break, I’ll switch back to increasing the amount I’m swimming again. I’ve been pleasantly surprised how quickly I’ve got swimming fit again after a long, long break. It did help kick starting progress by going three times the first week though. On Thursday I went to an interesting blogging event at a local McDonald’s. It was really interesting couple of hours and I’ll be writing more about what I experienced soon. Friday was a busy day because I went to my yoga class and then straight onto another blogging event. 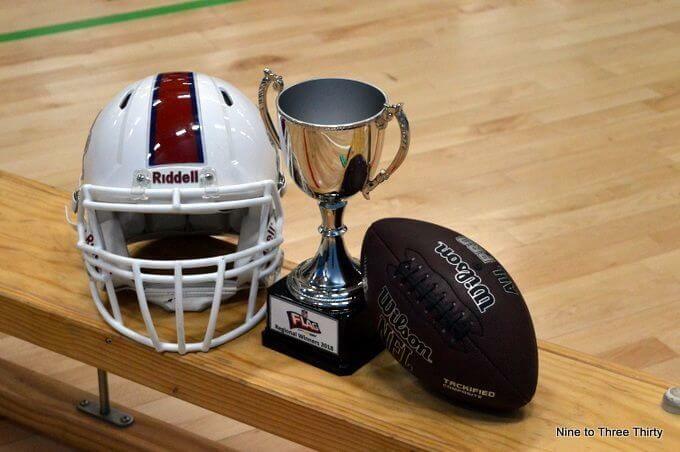 It was at the new University of Birmingham sports centre which I hadn’t seen (and very nice it was too) and it involved lots of local school children learning about NFL Flag, a non-contact version of American Football. Again more on that to come. Well done on increasing the swimming. I so wish I could go on my own as it is definitely my favourite form of exercise. I love swimming also and go 3-4 times a week. Have you found out what the lego giraffe was doing there? I think it must be part of the new Legoland Discovery Centre they are opening here, but not sure. Well done on getting fitter with your swimming. The giraffe is a very random thing to come across. 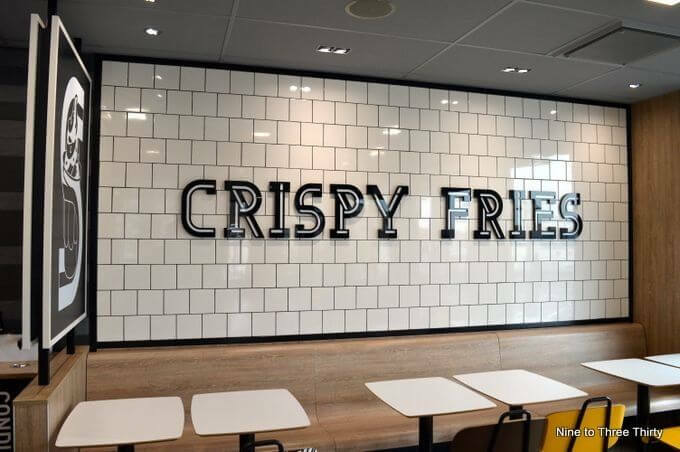 That looks like a very nice McDonald’s! I’m in awe of anyone who keeps fit. Well done on going back to swimming. 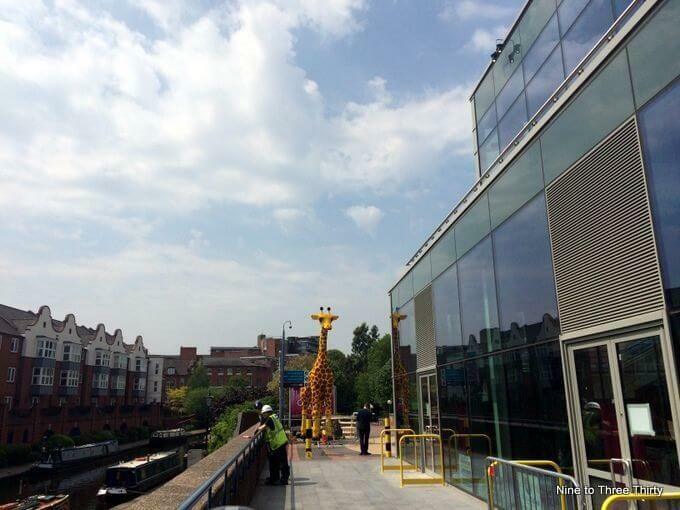 The Lego giraffe looks wonderfully bizarre by the canal. A blogging event at McDonald’s sounds intriguing. I wonder if McD’s are bringing their event here. I loved swimming and did 40 lengths 3 or 4 days a week for about 5 years. It is a great exercise so keep it up. Imagine if you had staggered round the corner drunk and saw the giraffe. I went to a McDonalds event a while ago and it was really interesting and certainly an eye opener! Well done on the swimming, I keep meaning to start some form of exercise but never get round to it, unless you count walking the dog! Glad to hear there is a non contact form of American football, after watching clips of my husband playing when he was younger, it can certainly be a punishing game!